Green tea lattes are a popular item at the coffee shops. I see a lot of people ordering these green drinks. Green tea lattes not only taste good but are good for you. These yummy green tea drinks are loaded with antioxidants. See the end of this post for a recipe. Making this green tea latte is so easy and it will save you so much money. The main ingredient in a green tea latte is Matcha. So what is Matcha? Matcha is green tea leaves that have been made into a powder. 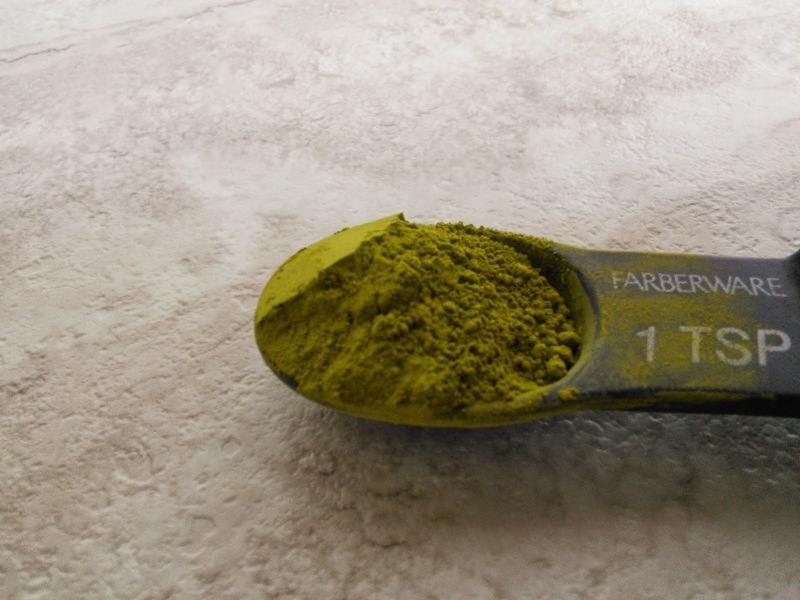 This green tea powder has 137 X more antioxidants than brewed tea thus giving you more benefits. Enzo Matcha powder is 100% organic and contains polyphenol EGCG, a well-known formula to increase metabolism and helps you to burn fat faster. It also is a great source of catechin polyphenols, awell-known antioxidant to protect human body from cancers, cardiovascular diseases and great for skin health to make us young and beautiful. Also Matcha is high in chlorophyll, which detoxifies your body and remove all toxins. Green tea Matcha is also great for you mood and memory as it is rich in amino acid L-theanine. I love using Matcha in my smoothies my morning smoothie as it helps me to be able to focus better to get my work done. I also love drinking a green tea latte made with Matcha in the afternoon before I go running. I have lots more energy that way. All it takes is one teaspoon of this green tea powder and the taste is not bitter like hot green tea. 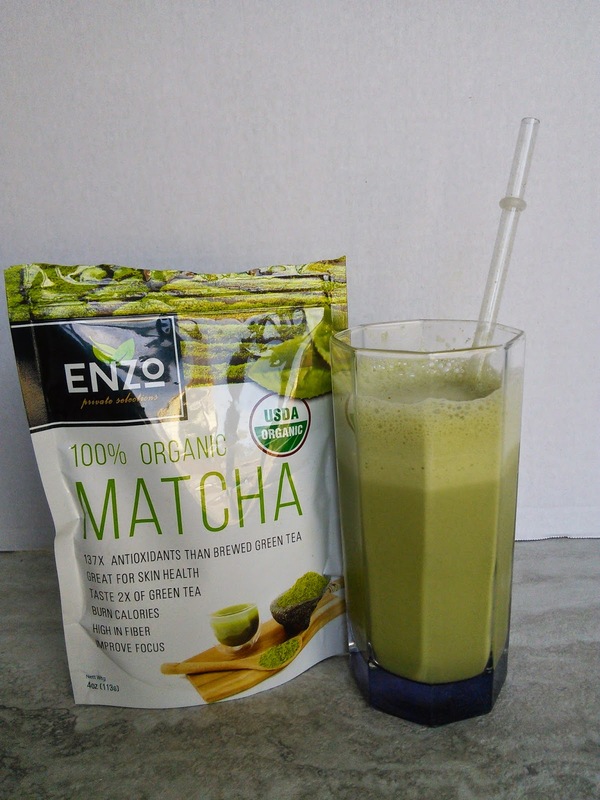 Click on this link to get more information about Enzo 100% organic Matcha Tea powder. The price may see high, but this bag has 24 servings in it, thus making it $1.00 per drink. Place all ingredients in a blender and process until smooth. You can use other sweeteners like Stevia or vanilla syrup and add more sugar if you want it sweeter. "These opinions are my own and I was sent the above mentioned product to write an honest review." what an easy recipe! Thank you for sharing! I must tell my MIL about this -- she loves Matcha tea! I have heard that green tea has amazing health benefits. However, I am not a personal fan of it. I've heard so much about green tea recently and how healthy it is! I'm definitely going to have to try this, I'll probably have to order from Amazon since no one around here sells it. Thanks so much for sharing! I always imagined making your own green tea would be a convoluted process, but it seems so quick and easy with your recipe.